This entry was posted in Stephen Green. Bookmark the permalink. Amen our children come first no matter what the school has to be a safe place for learning and teaching our children. Superintendent Green you are doing a great job keep up the good work we can’t save everyone adult or a child. Just do your best for the children. So grateful that we have a leader with clarity of purpose and clear thinking. This is a no-brainer and a non-news item. Thank you, Dr. Green, for exhibiting consistent and confidence-building leadership for DeKalb Schools in spite of rampant partisanship that pollutes our civic and public dialog. Thank you Dr. Green. Unfortunately, the devisive rhetoric of the nations political figures has emboldened many citizens to negatively impact our children and their families, Due process and diligence was done fairly and accurately. I think the news is the double standard. Hate speech from the left is tolerated if not encouraged in our schools. But if following the laws is in line with our new president and offends somebody, well then they’re outta there … because we must protect our children. Wow Stan…posting links from WorldNetDaily and Gateway Pundit….Were you wearing your MAGA hat while compiling this post? I don’t know about hate speech and I didn’t catch what the teachers said that got them fired, but there does seem to be a double standard or at least a heightened sensitivity around immigration and deportation. I have children at Peachtree Middle School. From the stories they tell me every week, I can’t imagine what the Cross Keys teachers said is any worse than the vulgar and abusive language they get from some of their teachers at the middle school. Just giving context to the Superintendent’s remarks. I’m currently a Make DeKalb Schools Great Again kind a guy. Total double standard! Libtards can say whatever they want, but if you are conservative, you get fired. P.S. We are going to build that wall!!!! Dr. Green made the correct call. Teachers I know are very careful to not engage on a political nature, but students want to discuss what is going on right now. I believe asking questions and playing devil’s advocate, and checking sources with older students is the way to engage. Less opinion more critical thinking. However, this was not my experience as a student in an affluent East Cobb high school. Most history professors were quite candid about their political leanings–all Republican. They were distainful of my more liberal opinions, and tough to debate. I took a foreign policy class my senior year, and was the only outspoken liberal in the class. However, I didn’t cry about not being heard or understood (or complain that conservatives don’t allow liberals to speak.) It challenged me to sharpen my skills. I have liberal friends in smaller towns that experience overwhelmingly conservative views in the school house today. I feel quite confident that liberals have not taken over the education system. That being said, students deserve to feel safe in their school. Teachers are responsible for their safety and well being. Teachers who cannot be sensitive to the needs of their students and respectful of cultural differences need to find a school that aligns with their values. Dr. Green made a good call, and people are now trying to politicize the situation. Nothing new to see here. DIO, my dear namesake, your comment demonstrates you have missed the point of Dr. Green’s position. The kids were threatened directly and personally by the comments. There are no partisan views that can justify that. Bring me an example of where a kid is being threatened directly and personally by a ‘liberal’ educator and I’ll go with you to Dr. Green and demand action against that “libtard” educator. Our schools should be a place where political views are openly debated as critical thought is … critical. That is a far cry from what took place. Please pay attention. No, Screwed. You’ve got it mixed up again. You get disciplined for threatening children in your care whether you wear an “R” or “D” on your sleeve. Now you go build that wall and everything is going to be alright. Dunwoody Parent – I wonder if those comments at PCMS are threatening the students. If so, perhaps they are not being reported? I know it is not unheard of for educators to abuse their power over children. It is up to other adults, teachers and parents, and if no one else, the students, to report. See something, say something is a cliche but to protect the kids it is the right approach. Kim, do you know what the teachers said that got them fired? What was said precisely is known only to the teachers and the students involved. Apparently, the implications were very clear to all parties and thus the parting of ways. Kudos to Dr. Green for speaking out and firmly supporting all students’ rights to a safe and welcoming educational environment. Sort of an aside but on the subject of firing: Stan, what’s up with HR and MIA Mr. Brown? If he has not been at DCSD since December, has the district sent out any notice to the local school administrators or to the BOE about who is covering his responsibilities? With contracts, budget, and job fair time fast approaching, it’s a critical time for HR. One would think someone would be assigned to oversee the whole department until he returns. Any word on who that is? Here’s is why there is a double standard. We can have a teacher blatantly call out an entire high school student body and call them racists (See GeorgiaEducator, Rebekah Cohen – but note the original post has been modified – it originally said that the entire student body was exhibiting racism), and not face any discipline, while others who basically repeat what the newly elected president of the United States stated as his main platform and get shown the door? Now why is that? It is because “free speech” only matters if it is the “right” type of speech in the eyes of Dr. Green and the school board. Its fine to demonstrate hatred of an entire high school because, well the word “racist” trumps any and all statements in the eyes of Green and many at the school board (and some on Stan’s blog). But repeat a campaign promise by the newly elected president? Not PC! You are gone! So, before I get called a name, I want to state that I do not endorse the President’s viewpoints on many matters. However, I do see a double standard here and that is unacceptable. Dr. Green is showing his true colors (and has been for the past 4 months with this SPLOST thing). Was more hopeful we’d bring in someone that wasn’t beholden to the PC police. Mr. Brown has been attending to personal family issues. The superintendent has kept the administration and BOE apprised. I believe a gentlemen by the name of Patrick Everett is attending to Brown’s duties right now. RunAmok: Threatening kids about a very real vulnerability does not equal political speech. Let’s keep it 100. Or for the other side of the aisle how about a President comes in on a platform of outlawing personal ownership of firearms? Do you want teachers threatening the kids of parents who openly support the right of individuals to own and bear arms? Am I missing something? No one wants that teacher managing their kids, do they???? “Behave or you’ll be deported.” … That’s a public service message. Is there any kind of manual for describing who a teacher can call and where a student can be sent? Behave or I’ll call the [cops, principal, your parents] and send you to [jail, ISS, home, the alternative school} is fine. Behave or I’ll call ICE and send you to Mexico is a fireable offense. If it were illegal to own something like firearms in your example, and a student and or parent owned said banned items? I would hope that the teacher reports them … and sends them back to Mexico. DIO: Were you around during desegregation of our public schools? I bet you were a real treat, if so. Anon: You’ve made my case for me. That kind of threatening behavior should always be reprimanded. Don’t you and DIO hear the profiling and bigotry in your own version of this dialog? How do you know a child’s status? Why are you picking on Mexican-Americans? Very sad that you can’t read in your own words precisely how wrong it would be for an educator to make such presumptions and pronouncements about a child’s family for any reason whatsoever. Calling out Gokce on his BS again. This isn’t the 60s. Stop equating it – apples and oranges. Lol. Brilliant analysis, Screwed. So, teachers should aggressively enforce political agendas and use that to threaten children randomly, right? Ok. These teachers are clearly in the wrong if this is what happened. I agree with RA, it needs to be the standard for ALL views. Emotions are high and school should be a “safe zone” for all children. Political views do not belong in the classroom. Gokce – you’ve not addressed the double standard notes above. Georgia Educator can call an entire high school racist and not even get a slap on the wrist? Yet these teachers did nothing that bad and got fired?!? Regardless of the race or gender of a person no student should be subjected to comments that cause them to feel ashamed. Schools are educational institutions, and it is important for students to hear different view points and ideas. I believe that any educator knows the difference between sharing information and making inappropriate comments. We all have our personal opinions about many things. As an educator, the school is not always the best place to express those opinions. But the same is true in any profession. This is an adult forum. It is not a classroom. No one is forced to read it. But if you are a student in a classroom, you cannot just decide not to hear remarks that are being made. If a person knows about students being mistreated, then they should report it. My spouse teaches in DeKalb. There were students in the class, who are American citizens but have undocumented parents, who were in shambles after the election. One child had packed their suitcase and kept it by the door in case ICE came to deport the family because the child has so few belongings. If educators threatened children with deportation, they should be fired. Period. Screwed: Notwithstanding that you promised you were gone and not coming back here I will pay you the courtesy of a reply. Mrs. Morris expressed concerns about how CK kids redistricted were being treated at CCHS based on reports that were substantiated by testimony and photo evidence. Not only did these events occur and not get repudiated, thanks to the responsiveness of Dr. Sauce, central office support resources, and private organizations, CCHS has conducted a school-year long effort to raise awareness on multiculturalism, diversity and bullying. By all accounts it has been very well received and successful in positively changing the dynamics among the students. I have been in direct communication with Dr. Sauce about how positively things have worked out and would say we can thank Mrs. Morris for raising the question. Certainly the kids who were being bullied thank her. So, you want me to damn Mrs. Morris for speaking up to defend students she was concerned about due to real events and make an equivalence with teachers who directly and personally threaten students for no other reason than personal resentments or politics? “J” … thanks for keeping us grounded. Those that want to dismiss the Green administration’s action in this matter are unaware of the complexities or ignore them. Either way, Dr. Green has again demonstrated that he has the sophistication and courage to lead DCSD with energy and clarity. For that, I am grateful and all DeKalb kids are better off in this regard. Please remember that for the Chamblee community, Ms. Morris’ post felt like being thrown under the bus. Yes, I know she felt terrible for “her” kids. Perhaps there was a time gap between the actions and the official response. But I think that’s called “due process” and taking time to define a solid and effective plan rather than just devising a token, knee-jerk reaction. From what I know of Dr. Sauce, he is completely committed to being responsive to problems like this and has absolutely no tolerance for bullying. Yet readers of Ms. Morris’ blog probably think that “the school-year long effort to raise awareness on multiculturalism, diversity and bullying” is due to her “righteous” post, rather than the initiative and commitment of the Chamblee administration. Just another way of looking at it. It’s tricky to call out an entire school when a small minority of teenagers does something reprehensible. I have to remember that myself. Anon, I agree with you completely and have full confidence in Dr. Sauce’s team. I am equally sure that Mrs. Morris’ efforts have absolutely no correlation as proposed above by Screwed. Dr. Sauce and I discussed how optimistic we both are about the our community and I have nothing bad to say about CCHS. Where I lose it is when folks try to deny the long history of bigotry within our community and want to pass it off as if it magically disappeared in 1968. The world has certainly changed. But the haters that fought desegregation right through the 90’s are alive and well and really have only changed their vocabulary not their way of thinking. I would add that the majority of folks realize Mrs. Morris’ intentions were well placed and that if she erred in scope, she just as quickly corrected her comment to be more precise. Those that keep stoking hatred towards her are working their own personal problem. Gokce BS alert meter is on fire!!!! I’ve come back because you are so full of complete crap that someone has to call you out on it. First, Morris called the entire school racists in her initial post. An employee of DeKalb county schools calling students in the school system where she is employed as a teacher racists. Someone (you?) ‘must have gotten to her because the post mysteriously was edited to pull back on that claim. But the fact remains, it was there. That was a fire able offense. Instead, you go and praise her?!? Give me a break. She. Called. Every. Kid. At. CCHS. A. Racist. Think about that for a minute. A teacher saying that. A teacher making a broad, ignorant statement. Folks, Gokce is not a parent at CCHS. I am. He likes to act like he’s in the know. He’s not. So yes, I’ll call you out on your BS as long as you continue to spew it. And Kim, we all know how you want to relive the 60s. You are dying to. Apples and oranges. Lol. Screwed. I’m an avid observer of human behavior. You know what I’ve noticed? Folks who get all in a lather about accusations of “racism” and can’t let it go tend to be guilty. I know CCHS parents who took offense to Mrs. Morris’ post and expressed their frustrations with her wording. She changed it because she agreed. Some of them even took the time to meet with her and come to a better understanding. You? Have you contacted Mrs. Morris? What did she tell you? Did she reiterate what you claim she says and thinks about CCHS? No? Duky noted that Kim Gokce just called me a racist. You’re such a hypocrite. Stan, can you please caution Mr. Gokce? Wait, I thought name calling was ok here, Stan? No? Utterly and shamefully ineffective. It’s my understanding that neither teacher was hired to work at CK but were transferred there by the county. Kim, you are amazing. Thank you for always sticking up for the amazing CK cluster kids. They are, without a doubt, the best students. And right now, many of them are living in fear. Fear that when they get home from school, their house will be empty bc their parents were picked up by ICE. And that is no exaggeration. I’ve had students tell me their parents are afraid to leave the house. Look, think what you want to think about immigration reform and The Wall. The fact remains that these are children and they’re terrified. No teacher, regardless of their political leanings, should ever be allowed to use a child’s undocumented status as a means to threaten them into behaving. Many of these children are themselves US citizens, by the way. Mom, is that you? I told you to stop trolling me on the web. Thanks for the kind word. This is the article in mentioned comments from several above the post. It was originally titled “Chamblee Charter HS Students Welcome Cross Keys HS Students With Racist Obscene Comments” if you look at the web address it still comes up that way. It was later that RCM changed the wording to “SOME Chamblee…” but it was already on the web and made everyone who lived in the Chamblee attendance zone to sound like a racist. Again, I know that I will get yelled at about this, but kids do crazy things and yes, it more than likely was a CHHS student who did it, but who is to say that it wasn’t a CK student who really wanted to go back to CK because of the love of their teachers and their friends. I don’t know how effective the teachers who were dismissed were because I am not there but if they are ineffective then yes that was probably their last nail in the coffin and they needed to be let go. But, if they have data that shows that their students were excelling in their classes and have not been put on a Professional Development Plan, then the county has a major double standard problem. The double standard being, that there is a teacher at a school in DCSD that finds a student every year and calls them worthless, useless and a waste of space. How do I know, I had to live this nightmare last year? Now that the students got to hear it and see that the teacher did not get any repercussion except a letter or reprimand in their permanent file. A file that will not transfer with the teacher if the teacher goes to another DCSD school. My child has to hear daily “why don’t you go and kill yourself because you are so worthless”. I am sorry, but everyone needs to stop the bickering. If this (CK Teachers) was a one-time thing, then they should have had a letter of reprimand put in their file and if it happened again, then they should be fired. You can’t do one thing to one teacher and not do the same to another. Screwed: “Folks, Gokce is not a parent at CCHS. I am. He likes to act like he’s in the know. He’s not. Well, I am a parent at CCHS, and CMS & HHES – I’m impressed Kim is engaging Dr. Sauce, that lets me know that Kim is likely “in the know” more than some others in the CCHS Community that, in my opinion, can go off half-cocked & uninformed. They tend to take their cues, if not outright marching orders from others. And like Kim I too am very impressed with Dr. Sauce & his team. And our kids at CCHS. As you know, there have been periodic emails/notices of incidences of concern – potential threats or at least bullying in a form that should be addressed, & it is. We get detailed calls & emails – reporting what it was (often something written on the bathroom wall), and the steps being taken to address them. I’m impressed. I’ll be at CCHS tonight -there is a meeting of the Cluster School Councils & some PTA leaders of the various schools. Maybe I’ll see you there? If not, reach out some time. Like Kim – I’m not hiding. 1. Repeat the primary campaign promise in a classroom by the winning Presidential candidate. I’m sure this list will continue to grow. After all, it’s why DeKalb is one of the worst schools systems in one of the worst public school states in the country. That is the title of a song used in the Civil Rights Movement. She would tell us that we were going to be so busy fighting each other over things that we were going to miss the big picture. I know that emotions and feelings can be very strong at times. But we have to stay focused on trying to make the school system do the right things for all students. All of our students deserve the best. Everett Patrick had a good reputation as the principal at Druid Hills High. However, I am not convinced that serving as a principal qualifies one to be the head of an HR department the size of DCSD. DCSD has had a long history of placing educators in roles for which they are not trained – it is a disservice to them and to the district. If Brown is going to be away for a long time, DCSD needs to find an interim that has an HR background, not an educator. 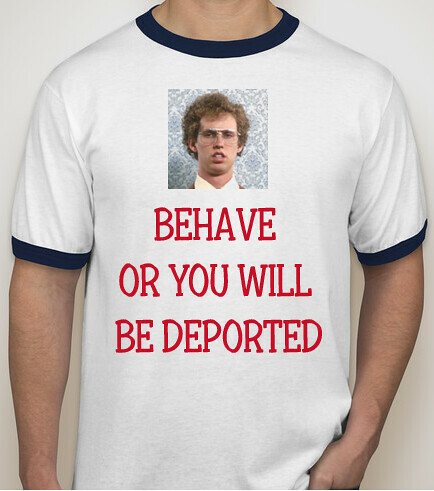 Behave or you will be deported. I couldn’t have said it better myself. Hard for me to see how illegal immigration doesn’t drive down low income Americans’ wages. But it’s a global world where the jobs could move to Mexico anyway. I doubt the landscaping and dishwasher jobs are moving there, however. But the economics, in my opinion, can get real complicated. So maybe I’m wrong, and most of our government, hospitals, schools, police and business owners are in the right ignoring our immigration laws. I’m suspicious of whether they are right. But the kids of illegal immigrants should be offered a quality education. I’m not concerned about a bunch of frills, but being in a school with a building is pretty important. Sure, every school has temporary space. I spent partial days in a trailer for a couple of years. It’s not that big a deal. We are well beyond that, though. I don’t like all this concern about validating people’s feelings (which is how I would describe Dr. Green’s last two paragraphs) when schools are at 130% capacity. It’s well beyond time for DeKalb County to start demonstrating that all people have sacred worth. We need two new elementary schools and a new high school west of I-85. The social agendas/redistricting plans of Kim or DIO are not my concern, and that is 100% what these discussions are about. Dr. Green needs to build 3 schools west of I-85 and whatever other modications to make it all work. That’s a substantial investment under the current plan. If Stan/DIO/North Brookhaven can convince people to spend even more, then I’m fine with that as well. Personally, I don’t think most people in DeKalb County value our immigrant population that much. I’m surprised they value them as much as the current plan demonstrates. I would have ignored the comments from the teachers and finished the school year out. They would not have gotten renewed contracts, however. The principle at CKHS is apparently pretty good. Both teachers taught English as a 2nd language. I doubt the mid year replacements are very good. It was well within the district’s discretion, however, to ask them to leave immediately (IMO). My 3 year old acts better than ya’ll and he’s not very well disciplined even for a 3 year old. Screwed: Dr. Sauce was very impressive and informative at last night’s meeting at CCHS. Based on my experience with him – I’ve come to expect nothing less. But since you are a CCHS parent “in the know” I would assume you already knew that as well, and agree he is a great asset as CCHS grows & moves forward. He certainly speaks of embracing the new students, and I think he is sincere – he walks the walk. Always a pleasure to engage him. And he speaks highly of the coordinated efforts between the Cluster & Region 1 Schools. Since you number yourself among those parents at CCHS that think you’re getting screwed, perhaps you should address your concerns with him. If you already have, please share what you learned. If not, why not? Stan, This post is completely off base. You’re promoting conspiracy theories and lies. The District took the proper steps to protect the students. I’ll remember this next time you’re up for reelection. We don’t support threatening, hateful treatment of children in this district. How is Stan promoting conspiracy theories and lies? The Superintendent issued a statement and Stan was kind enough to post it. He gave the statement context by telling us about what happened to motivate the Superintendent to issue a statement. No conspiracy theory or lies there. Seems like he’s just telling us know what’s going on. Wish every board member would do that. Please Anon. Read the headline composed by Stan. He made it clear he shares the skepticism about Dr. Green’s motivations. If not, why the questioning headline? If not, why let this cesspool of inuendo and slander go on unabated? Disavow the now lethal conspiracy theory right here, Stan. I repeat my first question. Seriously? Kim is right. Your bias is clear and posting Gateway Pundit is shameful and irresponsible. And now Dr. Green is getting death threats bc of fake news like the kind you posted here? Could somebody please explain to me why this statement is at all contentious? It seems to me that Dr. Green is simply trying to promote an academic environment where students can learn unperturbed by factors that will naturally invoke stress and/or fear. The teachers were not punished for having an unpopular opinion, they were punished for threatening their students and creating a classroom where kids were more concerned about their safety than their education. If students can no longer learn from a teacher (for whatever reason), then the teacher has (by definition) failed, and their termination is completely justified. @Yusuf – I totally agree with your statement. What I am saying is that there is a major double standard in this county. Last year my son had a teacher who called him “worthless, useless and will never amount to anything” in front of a classroom full of students for the first six weeks of school. The AP at my son’s school got tired of me complaining so much so they allowed me to change my son’s teacher. Guess what all he got… A letter of reprimand in his file. Students got to hear what the teacher said and saw that nothing happened to the teacher so guess what they students started doing. Bullying my son to the point where he does not feel safe or comfortable at his school. This year when we went back to the school to talk to the AP again about the bullying situation, he pointed his finger at me and said, “I told you not to move your son. He should have just stayed in the class and finished the year.” Are you kidding me? My question is… Why does one teacher get to stay and one teacher has to go? So, here’s a question…..does the district tolerate student bullying of teachers? Did the students who threatened to “jump” Petre face any disciplinary action (read statement from William Lutz)? It goes both ways people. Did any of you even read the full DCSD reports posted in the Reporter’s article? I did. My conclusion: I think Petre’s forced resignation may be justified if the statements against her are true. BUT, just as she doesn’t have the right to threaten students, students also shouldn’t have the right to physically threaten teachers. No matter the circumstance, threats from anyone should never be tolerated in the school environment. Regarding Dr. Clark, the “evidence” against her wasn’t compelling at all, and I’m glad to know she may lawyer up. I hope she sues DCSD and that she gets every penny she deserves, as her teaching reputation and career is probably now ruined. By the way Stan, thank you for bringing attention to this, stay the course. Hi Yusuf: I can explain why this is so contentious. Because “we” are not discussing the subject. Rather we are muddling it with other issues that we have with DeKalb Schools, Dr. Green, each other, or a random national political debate in an effort to contort a tenuously related argument such that it sounds plausibly related and furthers our own arguments (at least in our own minds). Makes perfect sense, right? Survey Says, yes I read the reports. The principal clearly had more than enough information to make the recommendation or would not have. We are all out here knowing absolutely nothing first hand. Yet happily speculating about what did or didn’t happen. It is pointless. Some of us have speculated so wildly that a purely partisan fantasy about Dr. Green has led to the man receiving death threats. We are idiots. This idiot is praying for Dr. Green and his family’s personal safety. Kim, the time line is important here. “Some of us have speculated so wildly that a purely partisan fantasy about Dr. Green has led to the main receiving death threat. “. That is incorrect. The teachers resigned or were fired, however you want to look at it. The story was reported in local news outlets. Two right wing sites picked up the story and put their spin on it. THEN, Dr. Green started getting threats. Dr. Green issued a statement. Stan posted a blog that described the sequence of events with Dr. Green’s statement. Nothing we have discussed here in any way was a catalyst for those that have made threats. Our discussion is after the fact. I think what you are insinuating is extremely insulting to Stan and many of us who read and comment here. Anon, I am not insinuating anything. I am directly saying that Stan posted this entry posing a question implying there is a question in his mind. After repeatedly asking whether that is in fact a correct interpretation he has declined to comment here and on facebook. I think that speaks volumes. As for the sequencing, I’m not suggesting that this blog has led to death threats. I am suggesting that extreme partisan banter here locally is what led to the story being picked up. If I could trace how that happened I would. I cannot and I am not implying otherwise. I have no issue with your point on the timeline – good reasoning. Let me get this straight. You are suggesting that Stan had some intentions because of punctuation? The question mark somehow indicated that he held some crazy belief? That’s quite a leap. I didn’t read it that way. Maybe it just meant that someone questioned the district’s actions and Dr. Green responded. That’s what I read. Stan made no calls commentary. If anything my take away is that he was trying to show the District in a positive light. I think it’s a stretch to see anything else. Well, Anon, we can just keep going back and forth on this or Stan could actually speak on the subject. Like I said, I questioned the reason for the open-ended form of the headline since he published it. Unless he decides to treat us to his views we are free to interpret what we think, no? It’s gotten kind of silly. There is SO much more, this system is corrupt. I have know doubt this is going to end badly, with our children paying the price. I ask Kim G: what is wrong with splitting CK in two ? And $$ doesn’t count. CK kids north and south do deserve schools on their neighborhoods ; updated facilities. All our kids do. Breaking up what is working isn’t the answer. An I personally am tired of all the “backroom” sleazy politics. I’m also tired of the name calling. Unless you really know someone you cannot call use the words racists or bigoted. Absolutely nothing. And that looks to be the outcome. As for “racism” … what “race” are we discussing? You lost me. Gökçe, I think you’re getting too wrapped up in everything else. This article was meant to bring everybody up to speed on every facet of this controversy. Look at this post for what it is. I tried to stick to the facts and make no commentary. I didn’t want this post to be about my thoughts on this. What everybody wants to know is … Were the teachers fired for pro Trump remarks. I also had a new statement from the superintendent. That’s where the title came from. The first paragraph is the same intro as the AJC article it links to. In the second paragraph I identified the sentence that generated all the controversy. I then say some news outlets took that statement and ran with it. There were two “news outlets” that have generated most of the controversy. I summed them up as succinctly as possible so people would know what all the hoopla is about. I then found Dyana Bagby’s article. She does a great job of telling us what happened at the schools. I summarize and link to Dyana’s article. I then posted Green’s statement. My article is a one stop shop to get anybody up to date on this situation. Dr. Green says “The voluntary departure of three school district employees” … that’s a lie or at least extremely deceptive. •	Effective Monday, February 27, 2017, Dr. Leo Brown who served as Chief Human Capital Management Officer since Jan. 2016, will serve in the capacity of Specialist II Compliance in the Facilities and Operations Division of the DeKalb County School District. •	Mr. Everett Patrick, currently the Director, Employment Services – Certification and Recruitment will assume the role of Interim Chief Human Capital Management Officer. He will serve in this capacity until a permanent replacement is hired. Stan, by posting it as a question you begged the question. So if you want benefit of the doubt then share it. I asked the question a little shocked at the headline and subsequently at the lack of response of the past few days while this thread devolved among other things into all sorts of accusations of bias and unfairness by Dr. Green in discipline policy application. What is the news here? What have we learned? I was hoping for a condemnation of such talk. The only thing I’ve learned so far is that you do not want to express your opinion on the question. That’s fine. Now we know and I will move on. @Stan. If you are out on FMLA you don’t get demoted upon your return. . I wonder what really is going on? I have a full time job, family and a life, so I hope you’ll forgive me if I’m not online 24/7 to answer your questions, Mr. Gökçe. I’ve received a lot of questions about this subject over the last couple of weeks. Dr. Green’s statement prompted me to write this article and how we got here. I’m just trying to aggregate all the information I can find. All I know is what I’m told by the school district and whatever else I can piece together from local sources. To DIO’s point, the fact the school district said “voluntary departure” casts a shadow on this. I can’t imagine Dunwoody Parent’s or Lynn King’s stories are unique. I believe an employee must have worked for that employer for at least 12 months before they qualify for FMLA. I don’t think Dr. Brown was there for 12 months before this personal matter came up. If DIO has doubts, that’s fine. But if you have a concern, I hope you take it directly to Dr. Green with your one employee rather than feeding doubt here where no one has any information. I just don’t see the possible value other than spreading doubts. As for the burdens of office, that’s why I respect anyone who serves even when I disagree with them. Dr. Green is the one that said “voluntary departure” in his statement, so I’m not sure what taking it directly to him will do. As part of the legislative body, I have bigger fish to fry. This article touches on a number of different issues. Hopefully, I have provided enough data points for people to decide for themselves. I suspect everybody will not come to the same conclusions. Maybe Dr. Green should issue new statement, this time regarding Education Secretary Betsy DeVos. Forget the distraction of Kellyanne’s shoes on the couch. This is the real story. Not fake. Not sure what HBCUs have to do with this post, but HBCUs were started because African Americans were barred from white schools. That’s not pioneering school choice, it’s formation because of lack of choice. DeVos showed a fundamental lack of understanding of the history of HBCUs. Talk about getting off topic. The original post was in reference to Dekalb teachers getting fired. I and many others indicated that there is a double standard going on in the county in which we fire teachers for making a comment on one side of an issue and don’t even reprimand other teachers for doing something similar on another side of an issue. It clearly shows that in Dekalb County, the only type of “free” and “acceptable” speech is that of the left. Shouldn’t our classrooms be open to all viewpoints? I agree with Survey Says. If you check out the documentation, it seems to me that the county overreacted and overreached. I think both of these teachers have a big time lawsuit on their hands. Your tax dollars at work, Dekalb citizens. Jason & Run: Admittedly off topic – sorry – but the other thread based on a “Statement” issued by Dr. Green was point blank on her – just too old. Although I did post there too. But I didn’t see this just as a “personnel action” thread, but more the intertwining of the current political climate regarding education, in light of the recent election & the impact it is having. This really was an intriguing mix of free speech, students rights, teacher interaction, and if you think bigger picture – now this immigration issue is weaving its way into all aspects of our lives. Especially in DeKalb, this end of the county (plus Clarkston) most notably. So her comments – tied to school choice – a buzzword of so many for years now, her spin on a “good example” of it, are beyond baffling. To me just a reminder that with this recent chaotic explosion of activity by Trump in so many areas (budget, healthcare, immigration, military spending, environment regulation, jobs, etc.) regardless of your views, those here are obviously interested/invested in education. Will it get lost in the shuffle? fly under the radar? – if allowed to – it might. So I plan on staying vigilant, and even those here who think I’m an idiot, I bet you will too. Let’s see if it comes up at all tonight, and if so, in what form. Yes. Unless or until those “viewpoints” become direct threats to students, intended or not. I sympathize with the people who lost their status with DeKalb but the assessment of the students, other educators, front office leaders, regional office leaders and the Superintendent was that they threatened the students. No one supports that. @ Kim. Using my personal case. Threat from a teacher to a student and to the parent. “You are useless and waste of space in my classroom.” And “I do not tutor lazy kids who don’t care about my class” Again how does that teacher get to stay? @lynn only if you aren’t PC do you get fired. Because after all, you can accuse an entire school of racism and be fine. Hell, some even give you kudos for that behavior. How do I get html publishing rights like DIO? 1. What I do on my blog, and what I do in my classroom is not one and the same. 2. When I originally worded the article “Chamblee Charter HS Students Welcome Cross Keys HS Students with Racist and Obscene Comments,” I was doing so in the same way that articles will say “Dunwoody Boys Beat Chamblee Boys 3-0.” No one assumes that all the boys at either school played during the game, in the same way that I (wrongly) assumed no one would think I was assuming all students made racist comments. 3. I know it might seem like a minor difference, but I was careful to not say that people were “racist.” I said people USED racist or obscene comments. I was trying to be careful not to assume the hearts and minds of the individuals who were saying and doing these things. However, I realize this nuance was lost on some people. 4. After speaking with several different parents, teachers, and students at Chamblee, I immediately rephrased the title to add “some” since it was clearly confusing/offending people to the point where they may not have been able to receive the very urgent message that needed to be heard. 5. And to answer some of the other speculative questions that have floated out there: yes, I talked to many individuals at CCHS before posting my article; yes, I tried to go through the appropriate avenues before writing about it. It made me sick to my stomach for a good week after I’d written that. I hated writing that article. Hated it. But I felt it was necessary, and I hope that people understood my heart and where I was coming from when I reported those facts. I was receiving multiple reports a week from multiple students at CCHS regarding these kinds of incidents, and I felt that the least I could do was put the issue out to the community so that they were aware. I knew that once the community knew, they would address it. @Rebekah – I am going to take your first statement… “What I do on my blog, and what I do in my classroom is not one and the same.” Then why is ok to fire a DCDS nurse who posted a comment on Facebook on her own time and not on DCSD time? Also, I go back to this, because kids do crazy things and personally we do not know who wrote those comments in the bathroom because we were not there. I personally know that every student you teach worships the ground you walk on because they all say that you have done so many awesome things to help them become better people and want to do more with their lives. So in the end how do we know or not know that CK students wrote these comments on the bathroom wall so that they could say they wanted to go back to CK because they feared for their safety and go back to a school where they already had a loving and nurturing environment already in place and not have to rebuild one at a new school? Rebekah, When the news article says “DHS Boys Basketball beat CCHS Boys Basketball”, that means the entire boys basketball team beat the other team whether everybody on the team actually played or not. When you say Chamblee High School Students are racist and obscene, that is referring to the entire student body whether they all said/wrote something or not. Ironically the idea of Chamblee sports & racist comments have recently “come together,” perhaps Rebekah, Lynn & DIO are aware of a recent incident regarding racist comments made during a Chamblee Girls soccer game. While it is very unfortunate that it happened, it was reassuring that Dr. Sauce immediately sent out a letter to the school community as soon as the story “broke” reporting it & making clear it was being investigated. And then he sent out a 2nd letter advising the player making the comments was identified and being dealt with, but more important & not surprising to me, he confirmed it was no reflection on the team or the school as a whole – there isn’t a culture of hate & racism at CCHS. But incidents do occur, and when they rise to the level requiring public reporting Dr. Sauce promptly does so. And more than these types of incidents, anonymous threats do happen on occasion, and Dr. Sauce similarly reports them as well as the steps being taken to address them. Since that time there have been various presentations to the entire student body on how any such behavior is viewed by the school. Sadly this is a reality this day & age, and happens in all types of school communities of various demographics, all over the country. And it should be taken seriously. I am satisfied that it is at CCHS. Dr. Sauce, his staff, teachers, AND the students/parents are appropriately concerned, without being over-reactionary. As for the discussion at hand & the incidents & article from the fall, I won’t attempt to speak for any here, but the way I read the exchange, Rebekah is saying she didn’t word the article clearly. And while I think the article did prompt those in the CCHS community to look into the school climate, & reflect on how CCHS was being perceived, I would say that as a CCHS parent & Chamblee resident, I considered the fall incidents, as well as the recent one, to be isolated and not a reflection on the school climate and student body as a whole, my daughter included. But we cannot fully control how we are perceived from the outside. I took Rebekah’s article and the discussion/debate that followed to be helpful in bringing it in the open. But did it fully reflect how I saw & continue to see our school? in my mind – no. So if it seems like I am somewhat defensive of CCHS – I am. It is a great place in my opinion. Is it undergoing “growing pains” & getting ready to experience more. I am confident that Dr. Sauce, the staff & teachers, and the students/parents are up to the task. I think it’s already been demonstrated. @Bill – I am not questioning what Rebekah wrote (we all have the right to free speech), what I was questioning was why it is ok for her to keep her job and for a DCSD nurse to get fired? They both said things on their own personal time, on their own personal devices that offended many. I hope that makes sense. @Lynn – I get that & others have made similar comparisons to other examples of “if this – why not that?” I just don’t think that’s for her to answer – obviously it wasn’t her choice. I would say that HR would be responsible & be able to cite policies that explain the potential inconsistency. Double standards are everywhere & as a general rule I don’t think they should be permitted. The nurse you mention, the CK teachers here, Rebekah, I’m not sufficiently informed of all the details to say the decisions were wrong, all or some. I would say that DCSD has a long history of unclear policies, such as board ethics, selective enforcement, that make it hard to understand what’s going on. The right of free speech in the context of public education, for administrators, teachers & students, can be touchy. The 1st Amend can be used as cover for abuses; PC &/or more conservative thinking can be used to quiet legitimate speech. Clear rules help, but even then you can end up in the courts, coming from both directions. And social media is making it more complicated – is cell-phone – text/snapchat/instagram bullying under the jurisdiction of the schools? What if everything happened while on school grounds. Maybe on the same wifi network? At a game? In a bus? What if it’s done in addition to traditional face-to-face bullying? This is tough. Adults (teachers) on facebook – better be careful too. An online article, a blog, what’s actionable? Tough. Consistent rules – to any doable extent, I’d like to see them. Maybe not be charged with writing or ruling on them. I just wish teachers would focus on teaching and not becoming political activists. Maybe we’d see better results in Dekalb County if that were the case. My kids teachers have all kinds of Obama crap up and rave about him. At the same time, my kids feel threatened to express an opposite view. It seems clear that free speech is alotted to only one side. Freedom of speech isn’t allowed for Republican, law and order, dissenting, or non-PC ideas. Ah, the tolerant left. If you want your kids to get fair and balanced, get the hell out of Dekalb. @ Bill – Per page 65 of the Student Code of Conduct, yes, online social media and cell phones are covered under the school system. Not tough to figure out, just not being enforced. Your next statement I am going to disagree with, and I am maybe just reading this out of context so if I am please excuse me. “obviously it wasn’t her choice. ” Yes, she made a choice to publish an article that she did not know the true facts on. She only has one person’s side of the story. Neither she nor I was in that bathroom so we can not say 100% who wrote those comments. If she did not have concrete proof, then she really should not have said anything on social media. Today, if you go and “Google” her article, the original title still comes up. I am just trying to keep the county out of losing money on a huge lawsuit, which I believe the nurse has a case since the precedent has been set that a teacher can use social media to call a school racist and that teacher was not fired. Do I want either person fired, no. I am just saying you can’t do one thing to one person and not to another. Yes, I know a number of parents in the CCHS community complained to Ms. Johnson. Do I know the outcome of the interactions between the system and Ms. Morris, no. That is between Ms. Morris and DCSD. I even sent Ms. Morris a private message about how upset I was at her language she used in her title. She did apologize and stated that she really did not mean the way the title came out. When the county settles lawsuits because of not following procedures and rules set in place and picks and chooses who they fire and keep on then the students lose and that is where I have a huge problem.